Narrative: Firefighters responded to reported washing machine fire. An apparent mechanical malfunction with a belt or motor caused the machine to smoke. Crews confirmed there was no fire, made sure the unit was unplugged and ventilated the smoke. Address: 2102 E. George St. Narrative: Firefighters responded to a house fire. See original post here. Address: 5433 S. "M" St. Narrative: Firefighters responded to a reported commercial structure fire. The first arriving engine company found light smoke and fire on an exterior wall of the building. Crews extinguished the fire that was confined to the wall area and ventilated the smoke. The fire was accidently started by an occupant burning weeds with a propane torch. Narrative: Firefighters responded for a reported grass fire. 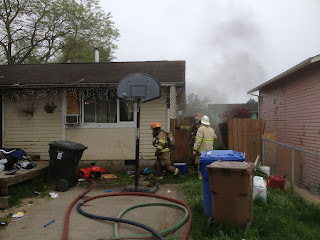 The homeowners had extinguished the fire prior to the crews arrival. Address: 5601 S. Orchard St. Narrative: Firefighters extinguished a small camp fire set by 4 juveniles. Address: 504 S. 30th St. Narrative: Firefighters extinguished a brush fire in what appeared to be a homeless encampment. Incident Location: 2102 E. George St. Narrative: At 9:16 a.m. firefighters from stations 2,8,9,11,12,15, and CPFR 6-3 responded to a reported dryer fire. The first arriving engine company reported dark smoke and flames showing from the back of the house. Crews attacked the fire that had spread throughout the laundry room, searched to confirm no one was inside the structure and ventilated the smoke. All occupants were able to escape safely and there were no injuries to report. The cause of the fire was an mechanical malfunction of a clothes dryer, resulting in an estimated $17,000 damage to the building and its contents. Narrative: Firefighters responded to a pull station alarm at a residential high rise building. Upon investigation they determined a unattended pan of food left on a stove caused smoke to fill part of the 7th floor. Crews confirmed there was no fire extension, ventilated the smoke and reset the alarm system. May 8, 2013 is National Animal Disaster Preparedness Day, and the Federal Emergency Management Agency and Tacoma Fire Department encourages animal owners to include plans and provisions for your pets, horses and livestock in the event of a disaster. Creating a pet survival kit with enough food and water for each animal to last at several days. Also include medications, cat litter/pan, a can opener, and food dish. Make sure identification tags are up-to-date and securely fastened to your pet’s collar. Make sure you have a secure pet carrier, leash or harness for your pet. For public health reasons, many emergency shelters cannot accept pets. Explore alternatives and find out if any hotels/motels in your area allow pets. For more detailed information about pet, large animal and livestock preparedness visit ready.gov/caring-animals. Address: 705 S. 9th St. Narrative: Firefighters responded to a small bush fire. Narrative: Firefighters responded to a garbage can fire at a bus stop. Narrative: Firefighters extinguished a smoldering bark mulch fire. Narrative: Firefighters extinguished a smoldering bark fire in planter area. Address: 3702 Marine View Dr. Narrative: Crews responded to a reported boat fire. The small fire was extinguished by the occupants prior to our arrival. Narrative: Firefighters extinguished a fire in a two foot plastic planter pot. The fire appeared to be started by improperly discarded cigarettes. With abundant sunshine and the opening day of boating season this past weekend, the Tacoma Fire Department would like to remind all boaters of measures they can take to ensure a safe boating season. 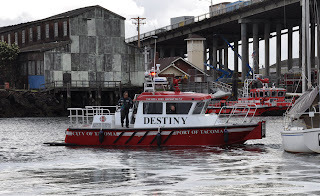 Obtain a Washington State Boater Education Card. Who needs the card? All boaters 50 years of age and under operating a boat or personal watercraft of 15 hp or greater. The U.S. Coast guard reports that in 2011, 533 of the 758 boating fatalities resulted from drowning, with 84 percent of the drowning victims not reported as wearing a life jacket. According to the Boating in Washington Handbook, children 12 years old and younger must wear a USCG-approved life jacket at all times when underway in a vessel less than 19 feet in length, unless in a fully enclosed area. Designate a sober driver.BUI (boating under the influence). It shall be a violation for a person to operate a vessel while under the influence of intoxicating liquor or any drug. RCW 79A.60.040. According to the U.S. Coast guard, operator inattention, improper lookout, operator inexperience, excessive speed and alcohol are the top five contributing factors for boating accidents. May 5-11, 2013 is National Arson Awareness Week, and this year’s theme is "reducing residential arson". To report a fire call 9-1-1. In a non-emergency situation, when you know or suspect that an arson crime has been committed, or to report suspicious activity, call (253) 591-5740. Visit the U.S. Fire Administration for additional information. Narrative: Fire sprinklers credited with extinguishing a fire. Crews responded to a automatic alarm in a mixed occupancy building. Upon investigation they determined a fire had started on a kitchen table of a second floor loft apartment. The sprinklers contained the fire before it could spread and cause significant damage. Crews confirmed the fire was out, shut off the system and concentrated their efforts on removing the water from the building. Address: S. 14th St/S. "I" St. Address: 1212 S. 27th St. Narrative: Firefighters responded to a reported apartment fire. Upon arrival they determined that a faulty exterior light fixture caught fire causing minimal damage. Narrative: Firefighters responded to a dumpster fire. Address: 1246 S. Grant Ave. Narrative: Firefighters responded to an oven fire. The homeowners used a dry chemical extinguisher on the fire, crews confirmed the fire was out and ventilated the house. Damage was limited to the stove. Address: 4800 S. Oakes St. Narrative: Firefighters extinguished a exterior shrub fire near occupied business. The cause was undetermined. Address: 6232 S. Orchard St. Narrative: Crews extinguished small beauty bark fire. Address: 2401 S. 35th St. Narrative: Crews extinguished a small garage fire most likely ignited by the home owner burning weeds to close to the structure. Narrative: Firefighters confirmed that the small fire that the occupants had extinguished was out and there was no extension. Narrative: Firefighters responded to a reported commercial structure fire. The first arriving engine company found smoke showing from the laundry business. Upon further investigation crews determined that a fire had started in the dryer duct work. They extinguished the fire, and evaluated one patient for smoke exposure. Address: 3717 S. Ainsworth Ave. Narrative: Prohibited outdoor burn of household furniture. Address: 1429 E. 46th St. Narrative: Prohibited outdoor burn of plywood with inadequate clearances. Address: 7403 East "E" St. Narrative: Crews extinguished a fire that started in the refrigerator unit of a 35 foot travel trailer. One patient was evaluated and treated at the scene. Address: 7235 S. Madison St. Narrative: Crews extinguished a brush fire started by a juvenile. The youth and family were referred to our Firestoppers program. Address: 4015 S. "M" St. Narrative: Firefighters extinguished a bark fire in a 6 foot long planter box.